On Tuesday, President Recep Erdogan lashed out against the US troop presence in eastern Syria, charging that plans to establish observation posts along the Turkish border are meant to aid terrorist elements. “Those who say they are countering (ISIS) in Syria are in fact allowing a small group of terrorists to exist in the country to justify their presence in the war-torn country,” he said. Erdogan alleged that the US is actually showing a preference to “live and breathe with the terrorists.” “The only target of this terror organization (YPG)… is our country,” he said. “It’s not possible for us to remain idle against this threat.” Clearly, what is unfolding is a US game plan to block Turkish military’s future operations in northern Syria against the Kurdish militia. Pentagon regards the YPG to be its most effective Syrian partner. Simply put, what we see here is the Syrian equivalent of what Washington did in 1991 in Iraq by imposing a “no-fly zone” over the Kurdistan region in the north. The US is playing the long game. It is exactly three years since President Obama deployed 50 commandos to advise the Syrian Kurdish militia in their fight against the ISIS. Obama insisted it was “just an extension” of “special ops” that the US was running already. But the numbers steadily kept increasing from 50 to 250, from 250 to 500, and from 500 to 2000. The true figure today is around 5000 and growing. The intriguing part is about the US intentions. Stated purpose of the Operation Inherent Resolve is to defeat the ISIS, but lately it has shifted to countering Iranian presence in Syria. According to the US special representative for Syria engagement James F. Jeffrey, Trump has agreed to keep U.S. troops in Syria indefinitely. “We are not in a hurry,” he said. Turkey’s worst fear may be coming true a Syrian Kurdistan taking shape right along its border. Indeed, this becomes a template of the overall US strategy to encircle Turkey and Iran and to control Baghdad and Damascus and eventually to make Russian presence in Syria untenable. 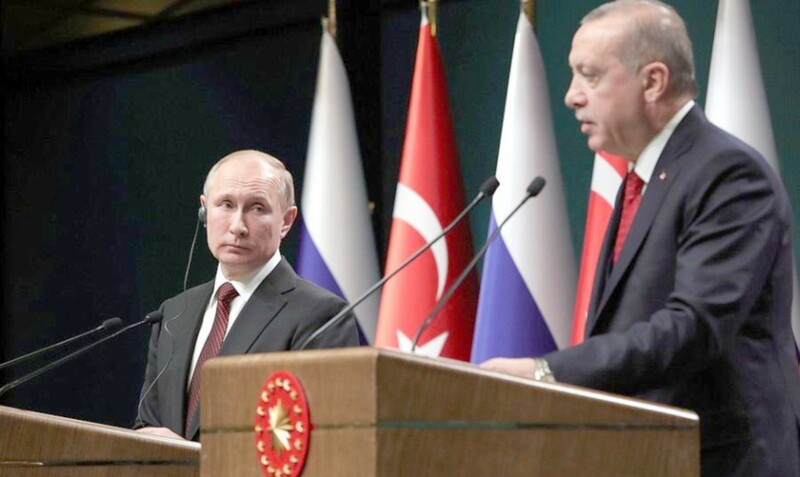 The US aims to put a knife into the heart of the Turkey-Russia-Iran axis in Syria by accentuating the contradictions in the region. The gloves have come off vis-à-vis Iran, Pentagon is now “defanging” Turkey and it remains to be seen how long the gloves will remain in place in the dealings with Russia. In a candid interview with the Russia media on November 21, Jeffrey, Special Representative for Syria Engagement Jeffrey sounded testy. He repeated that the deployment of S-300 missiles to Syria is a “dangerous escalation” “we would urge the Russians to be very careful with this” and assertively spoke of the new sanctions against Iran and Russia for oil shipments to Syria, while also rejecting offhand any talk of tradeoffs with Russia over Iranian presence in Syria and debunking the Astana process. Jeffrey even reserved the US military’s right “to exercise our right of self-defense” if Russian forces on the ground came in the way. (Jeffrey disclosed that there have been military engagements with the Russians so far in “about a dozen times in one or another place in Syria.”) Pentagon will press ahead with the establishment of observation posts on the Syrian-Turkish border despite Ankara’s objections. Turkey’s hour of reckoning is approaching. A few days ago, Turkish media reported that Saudi and UAE troops had deployed to northern Syria. In early November, the UAE reopened its embassy in Damascus.